Located at 211 Bear St., Bison Courtyard brings a curated blend of businesses together in the heart of Banff, Alberta. Those in the know come to the courtyard for the best dining, shopping and services in town. The building was inspired by its national park surroundings: open spaces encourage us to linger outdoors while rooflines draw the eye up to the mountain peaks. The upper level houses residential apartments for a true community feel. Our central courtyard was designed for people to gather and hosts regular events that encourage cultural and community connections. Bison Courtyard is just steps away from local galleries, museums, parks and river pathways. In summer, pedestrians take priority on the Bear Street Woonerf. Breezeways in the south and west of the Courtyard offer additional points of entry and easy access from nearby hotels. History is all around you in Canada’s first national park. We unearthed a little piece of it when digging the foundations for the courtyard; two ancient bison skulls, dated at over 6,000 years old. The name Bison Courtyard honours this discovery. It took on a special significance in 2017, when, more than a century after being driven close to extinction, the plains bison was reintroduced to Banff National Park. See more at Bisonbelong.ca. In the heart of the courtyard you’ll find another landmark in Banff’s history – the Old Crag Cabin. Constructed between 1888 and 1890, in the classic Hudson’s Bay Corner style, this traditional log cabin has played many roles in our community. From 1901 to 1929 it was the home of our local newspaper, the Crag and Canyon, under the ownership of ‘Mr. Banff’ himself, Norman Luxton. Arctos & Bird were proud to give the Old Crag Cabin a home in the courtyard and received an award from the Banff Heritage Corporation for our restoration efforts. 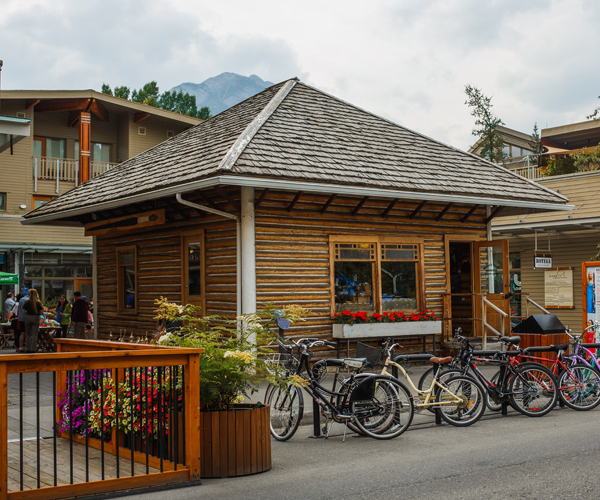 Since 2005, Bison Courtyard has been part of the fabric of downtown Banff, providing a hub for local businesses to thrive. We celebrate Banff’s heritage while building a sustainable future for our community. Our environmental values are built right in to Bison Courtyard. The building is designed to be water and energy efficient, maximize natural light and promote natural air circulation. Each level of the courtyard celebrates our mountain ecosystem with landscaping that showcases the region’s native plants. We make it easy for our tenants to keep it green by recycling and composting their organic waste. Bison Courtyard is more than just a building; it’s a thriving community, where people live, work and enjoy the beauty of Banff National Park. The open central courtyard is a social space that hosts community and cultural events throughout the year. If your business shares our values and you’d like to join our community, check our current listings here.